Splash into the water with these must-have pool toys on our list below. Those summer days are coming soon and when summer's around - that means heat. One perfect way for your toddler to get cooled off during those blazing hot days is by cooling off in the pool. Your child won’t feel bored just swimming or splashing around. With these pool toys, it will make swimming and pool time a little bit more fun! We’re sure whatever you’re looking for to make your swimming days a little more exciting you will find it on our list below! No more just swimming around aimlessly! For this update we made sure that each pool toy matched our list of criteria. We also added more information about pool safety and why pool toys can be beneficial to your children in our criteria section. Be sure to check out our FAQ below for any other questions you may have, we’re sure you will find the answers that you’re looking for. This is an amazing toy that is both environmentally friendly and super safe for little ones. The fact that it is dishwasher safe is even more incredible, and will ensure long lasting fun. 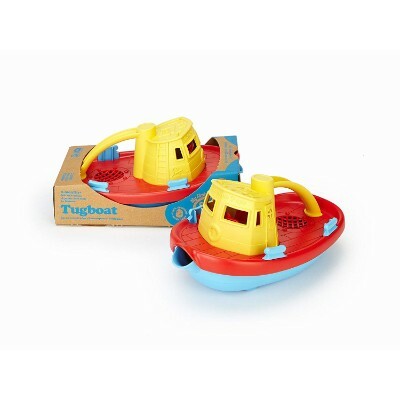 The tugboat toy is a great toy for toddlers to enjoy in the water. 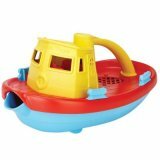 Your toddler will be able to observe how water moves as the tugboat can take on water and then pour it out in a cascading waterfall out the front. If used in the swimming pool, it is a great way to demonstrate the concept of floating and to promote learning to swim as a fun and happy experience, rather than a stressful or scary one. The floating toy is completely safe for toddlers to touch or put in their mouths. As long as it is kept clean, it is safe to use as a spout to pour water on children’s heads. It comes in three different color options, all incorporating yellow, red, and blue. The tugboat can scoop and pour water, for fun or for rinsing a child off gently. The name “S.S. Green Toys,” a ladder, life preserver, anchor, lights, and horn are etched on to the body of the boat. It is lightweight and user-friendly for toddlers. This toy is recommended for babies as young as 6 months old and can be enjoyed for years to come. The 100% recycled milk jug composition is durable, and can even be washed in the dishwasher to avoid soap-scum buildup or mold over time. This adorable little submarine is a great way to introduce water play and encourage swimming skills in the smallest members of the family. This submarine-shaped toy is a floatable and submersible toy that can be used in a swimming pool or during bath time. The submarine is made in the United States, out of 100% recycled milk jugs that have been processed into a durable material called high-density polyethylene. 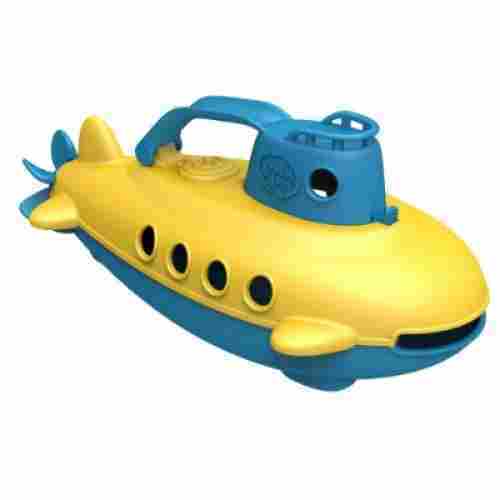 The submarine toy is completely safe for toddlers as it contains no harmful chemicals that can be found in plastic toys. 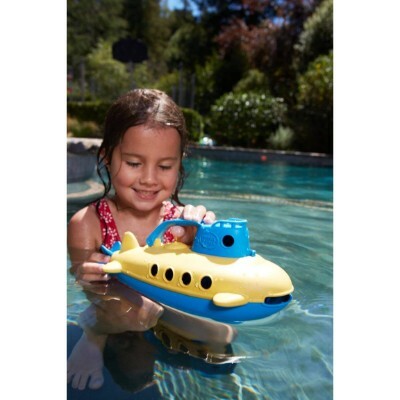 This submarine is an excellent way for your little ones to have fun while getting comfortable in the water. If used in the swimming pool, submerging the submarine could be a great way to encourage your toddler to learn skills like holding their breath and swimming under the water’s surface. When it floats, it’s also an excellent way to demonstrate how to swim with their head above the water. 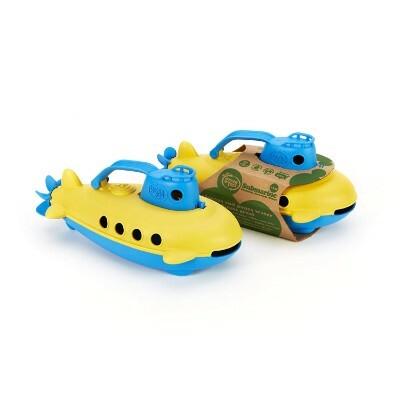 this submarine is made with recycled, non-toxic materials that you can feel comfortable letting your little one explore. It comes in a bright blue or yellow design. The submarine is complete with a rotating propeller at the back, and a handle to easily scoop and pour water for fun or for a rinse. The vessel can be submerged underwater and sink to the bottom of the tub or pool, or it can float once the cabin is cleared of water. The cabin can be opened to clean the inner surfaces of the toy. The submarine is safe to use in the dishwasher to keep it clean for long-lasting durability. This toy is recommended for toddlers 6 months and older. It has been constructed from PVC and is neutrally buoyant after it has been filled with water. 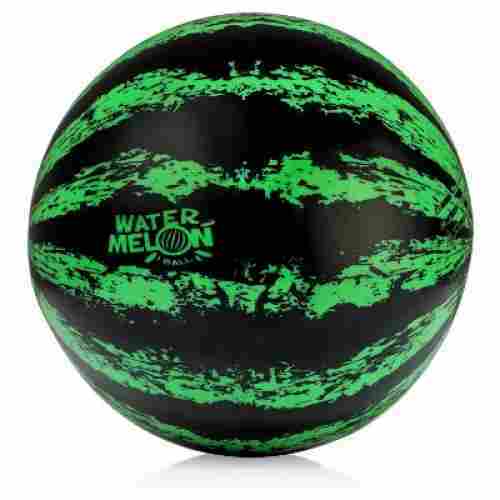 The PVC construction makes the watermelon ball extremely durable and able to withstand thrilling games. Enjoying the pool can often be thought to be a relaxing time on a raft getting some sun, but this toy turns the pool into a playing field. The watermelon ball is an excellent way to turn your boring afternoon into an exciting game with friends. It is a great way to encourage exercise and promote a more active lifestyle. The game is best-suited for children and adults over the age of 8 years old. It can get pretty intense when players are trying to move past each other. 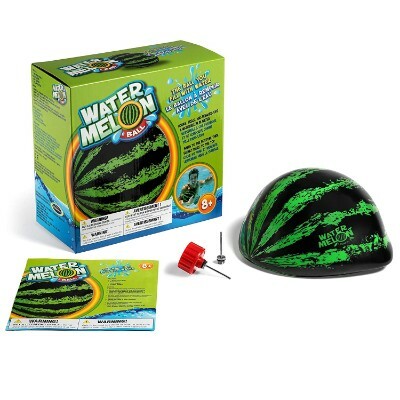 The watermelon ball has been created to open the pool to many creative ball games that you would normally not be able to play. If you are looking for a new and fun way to engage with large groups of people in the pool, this is just the toy for your next party. 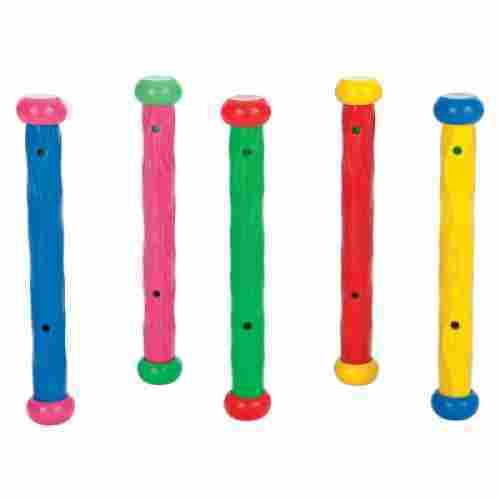 These colorful, sinking play sticks are awesome for helping kids practice their swimming and diving skills. Underwater swimming is quite different than the classic “doggy-paddling” on the surface. These sticks encourage kids to go below the water’s surface and healthily push their comfort zones. 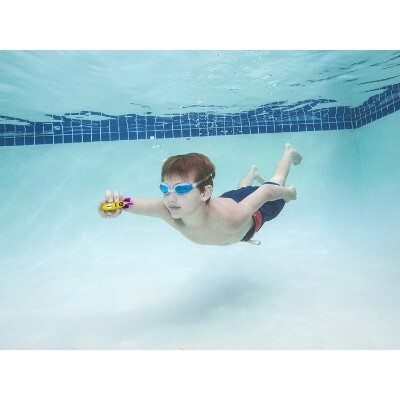 Dive toys encourage kids to practice diving, holding their breath, and aiming for targets under water. It is important for kids to know how to swim regardless of whether you have a swimming pool or not. 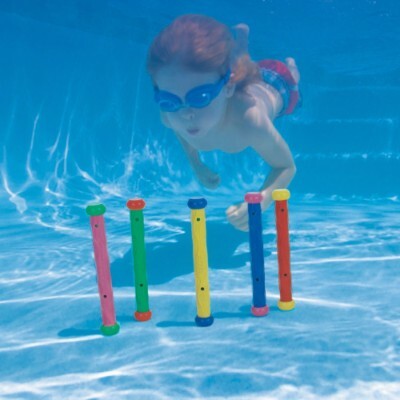 These play sticks help kids to practice their swimming skills while having fun. Swimming is a full body workout, working all the muscles without straining joints and promoting cardio exercise. Swimming and diving help children develop gross motor skills involving the arms and legs, and then aiming for and grasping the sticks develop fine motor skills using the hands and fingers. Because these sticks are meant for diving, they are great for assisting in the development of breath control. 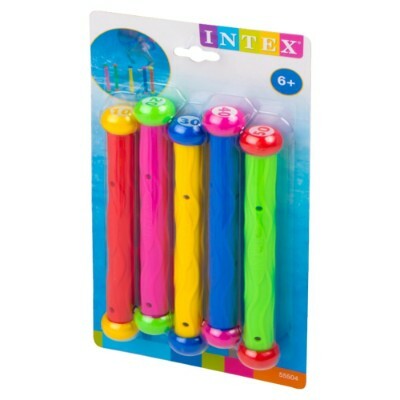 This set of underwater dive sticks is a fun diving toy for children who can safely swim underwater. When tossed throughout the pool, the play sticks sink to the bottom and remain standing in a vertical position for easier grabbing. The sinking play sticks are either blue, pink, green, red, and yellow. The bright colors help in finding them at the depths of the pool. They are made out of a flexible material for safely gripping underwater. Each colorful, sinkable stick is 8 inches long and 1 inch thick. A neat concept that brings the games of volleyball and basketball together to be played in the pool. Offers hours of competitive fun. Do your kids play basketball outside of the pool? 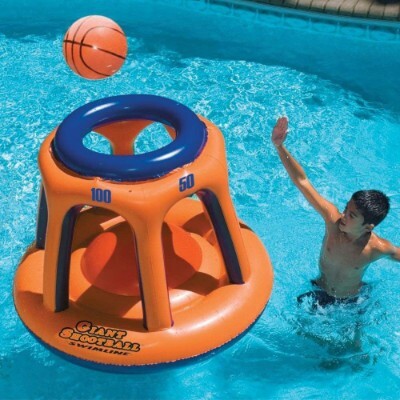 Then they will love this giant floating Shootball Game pool toy. The set is an inflatable floating hoop and ball that is great for fun in the pool while enjoying a nice hot sunny day. Engaging in a game of shoot ball is an excellent way to fine-tune hand-eye coordination. Much like the game of basketball where you shoot the ball into a hanging hoop, shoot ball uses the same basic concept. Players shoot the ball into a giant floating hoop with multiple ports. The hand-eye coordination comes into place when shooting the ball into the ports. The hoop has been constructed so that there are multiple ports that allow for more than one player to play at a time. The hoop and ball are made of heavy-gauge vinyl, making it extremely durable and flexible. The hoop measure in at 45 inches tall and the included ball is 36 inches by 45 inches. The kids will go nuts over this pool toy, keeping them busy for hours while you enjoy an afternoon by the pool. This fishing game is an excellent way for children to practice swimming and diving through play. We believe there is always added motivation for children to continue to learn new concepts and skills when the process incorporates fun. This net-fishing pool game is a fun game for the pool involving swimming around with a toy shark net to catch and collect little fish. 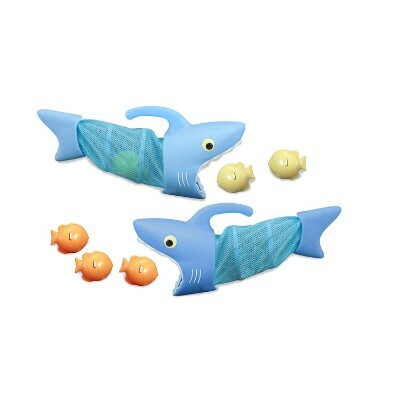 The shark is made of sturdy plastic and mesh, and the fish are plastic. 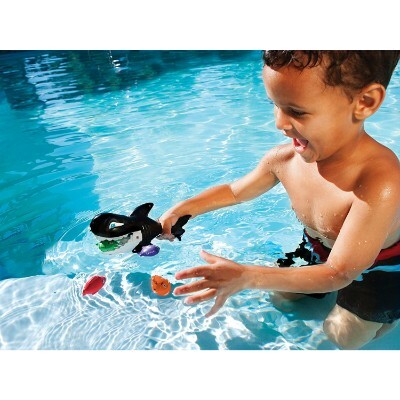 The pool fishing game is a fun and exciting toy that encourages kids to practice their swimming skills. Swimming underwater involves breath control, full body coordination, and strength. As this game incorporates physical targets to aim for, your child will experience the added benefit of hand-eye coordination and strategy in order to achieve their goal. Through playing with these toys and exploring various games using them, your child will be further developing fine motor skills by grasping the shark fin handle, gross motor skills by swimming, and enhancing spatial reasoning skills. Upon full capture of all the fish, your child will build self-confidence in their abilities to achieve goals. Additionally, if this game is played with one or more peers or family members, the kids will be practicing the development of a healthy sense of competition and hopefully, good sportsmanship. 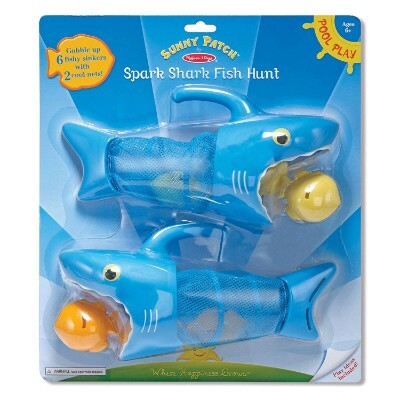 The shark and fish designs provide inspiration for underwater imaginative play scenarios. The set comes with two shark nets, six little fish to catch, and a set of various game suggestions utilizing the nets and fish. The net is shaped like a shark with its dorsal fin serving as the handle to guide it swimming on the hunt for capturing the fish. The shark’s open mouth is the opening to the net, which encompasses the shark’s body. The plastic handle is easy for children to grip and maneuver while swimming in search of the fish. The fish are approximately 2 inches long and sink slowly when scattered across the pool’s surface. Melissa & Doug recommends this fun swimming toy for children between the ages of 6 and 8 years old, however, we can see that it is suitable for any child who can safely swim underwater. 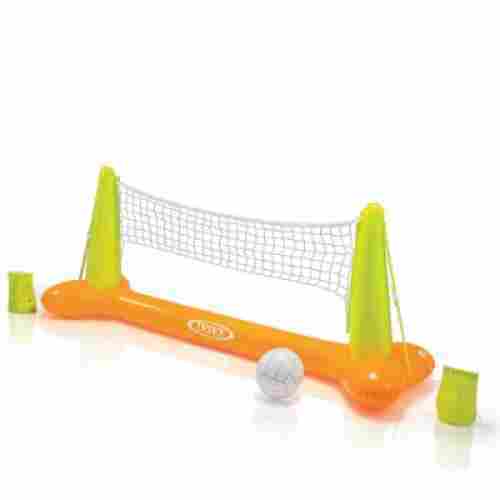 This volleyball game is the perfect addition to any family beach vacation or poolside get-together. Childhood obesity is a huge concern in our country right now and affects over 13.7 million children. Volleyball is an excellent cardiovascular sport that can help improve muscle tone and increase dexterity. Swimming is a great way to relax but can also help improve cardiovascular health. Bring the two together and you have a perfect recipe for enjoyable exercise. 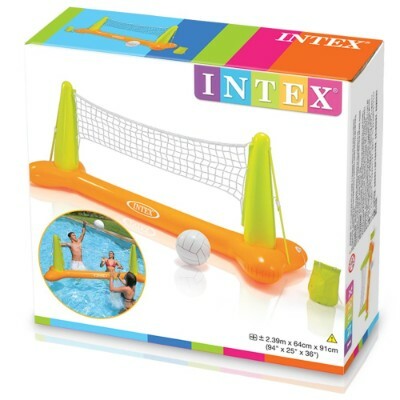 With the Intex Pool Volleyball game, you can bring the fun back to the pool by combining two exciting sports, swimming and volleyball. 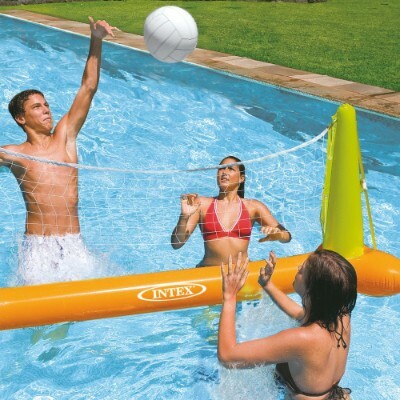 This inflatable volleyball net is the perfect size for any backyard swimming pool and the included anchor weight bags mean you could even take this on vacation! Lakeside, beachside, or poolside. Wherever you are you are guaranteed to have hours of fun and familial bonding as you battle against each other to see who can be volleyball champion! The Gobble Gobble Guppies pool and bathtub game is great in that it has educational and physical developmental benefits for toddlers. The guppies float on the surface of the water, making this game safe for children as young as 2 years old. This game can also be played in the bathtub. This Gobble Gobble Guppies game is an awesome educational pool toy for toddlers. 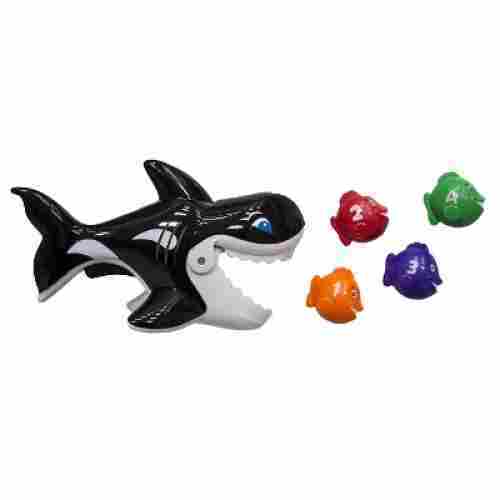 By controlling the orca toy swimming around and using the trigger to open its jaw, your little one will be honing their fine motor skills associated with hand and finger movements. Locating and aiming for the guppy targets will help your child develop spatial reasoning skills as well as hand-eye coordination. The four numbered and colored guppies help your toddler begin to understand numerical counting, categorization, and colors. This fun game can also support toddlers who might be nervous or resistant about learning to swim. 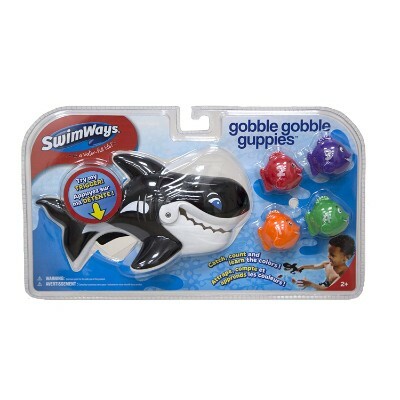 Swimways Gobble Gobble Guppies toy set comes with one orca toy and four colorful guppies, each guppy numbered one through four. The guppies are also each different colors: red, orange, purple, and green. Squeezing the trigger on the whale’s tail causes the toy’s mouth to open wide, so it can be guided to gobble up the four little guppies. Fulfill your little girl’s fantasies by transforming her into a real-life mermaid who can actually swim around the pool! The included monofin fits comfortably under the tail and provides serious propulsion in the water. 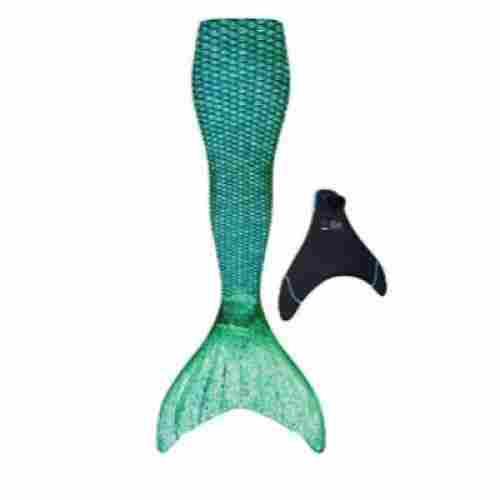 Designed for children 6 years and older, this tail is guaranteed to make your little girl the most popular mermaid at the pool! The included monofin is made of flexible and unbreakable polypropylene and dive-grade neoprene. It does not require feet to be strapped in which makes removal, especially in case of emergency, easy and simple. 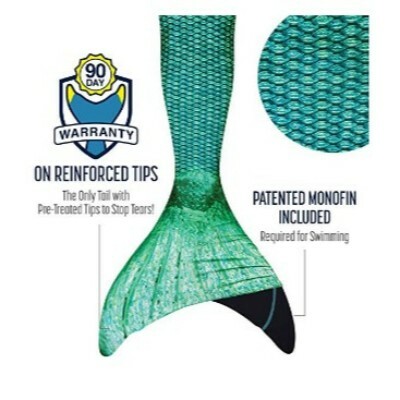 The tail and fin design encourage dolphin-kick style swimming, similar to swim fins. This type of swimming is perfect for developing underwater breathing and swimming skills. Every little girl dreams about being a mermaid, free to float about in the water and live in a magical underwater kingdom. 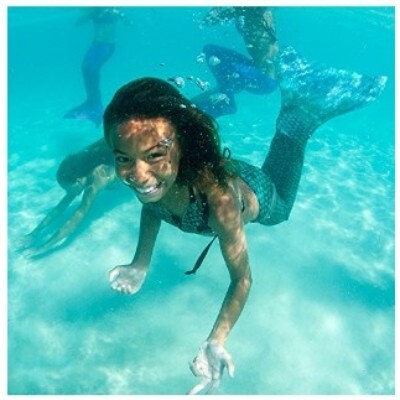 Her dream can become reality with Fin Fun Mermaid Tails for Swimming! These beautiful and intricately designed swimsuit-style tails are covered in realistic scales that sparkle in the water! As your child dives to retrieve the toys they will be improving their swimming skills while getting plenty of exercise. Their bright colors make them easy to spot at the bottom of the pool. 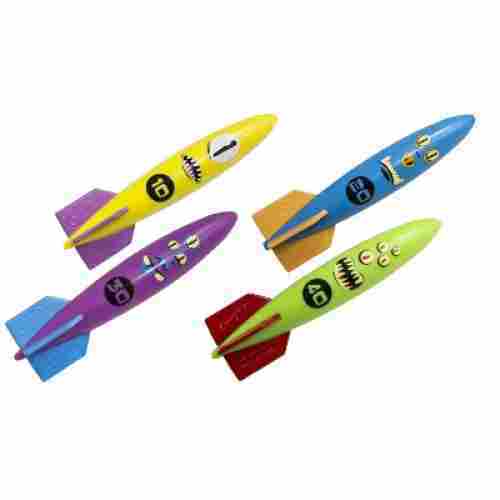 The 5-inch long torpedo dive toys each come with a number, either 10, 20, 30 or 40 representing a point system that can be utilized. 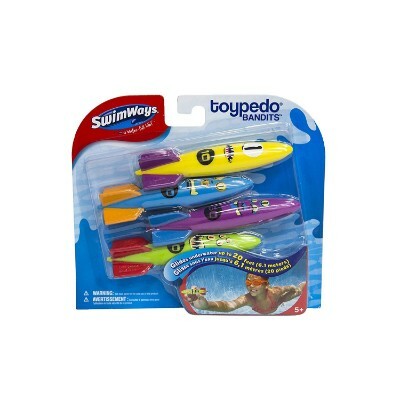 Swimways recommends the Toypedo Bandits for children 5 years and older. The bandits are awesome dive toys that have inherent educational benefits. The dive toys each have a different number (10, 20, 30 or 40) so that they can be used for point-based games that may involve counting or simple addition. Each dive toy is a different color, also providing the incentive for color-based categorization games involving retrieving the toys from the bottom of the pool. Diving for the toys involves the development of space recognition skills as well as gross motor skills associated with swimming. Breath control must be used to hold the breath long enough to retrieve the dive toy and return to the surface. Finally, the standing dive toys are grasped, aiding in the development of fine motor skills associated with hands and fingers. Coming up with our top ten list of best pool toys in today’s market wasn’t going to be easy. To help parents from spending hours of their limited free time doing research on which pool toy is the best for their children, we took everything into consideration for you. For our list, we knew it wasn’t going to be an easy task. We took everything into consideration from safety, how beneficial these toys can be for your children. We also looked at everything from what was the highest rated to which toys customers were overly satisfied with. We also looked into everything from customer feedback not just with the positive reviews, but we even looked into the negative ones as well. We wanted to make sure that each toy on our list would help promote an active lifestyle for your children and get them excited about getting in the pool during this time. Each product on our list is perfect for any pool day, gift, or occasion. Any kind of water play these toys we are sure will satisfy your children and get them away from those screens on that nice beautiful summer day. We’re sure whatever you are looking for you will find what you need on our top ten list above of the best pool toys for your children in today’s market. All pool accessories get wet in one way or another when used, whether it be a huge inflatable floating raft or a small floating tugboat for toddlers. That means that pool toys tend to be at higher risk for mildew, mold, or rust over time. We tried to select swimming pool toys that are relatively easy to dry out and clean, such as not having too many small unreachable parts. We even selected a couple items that are dishwasher safe, providing the opportunity for a deep clean and drying as a preventative against mold or bacteria build-up. We only wanted toys on our list that could support children and help them float along the water. However, it is recommended that with certain floating devices that parents pay attention to the weight capacity that each device can hold. Every toy on our list is 100% safe for your children to use and enjoy their time in the pool with. We know how hard it can be for parents to get their children away from screens especially when it’s such a nice day out so one-way parents can encourage their child to be active is with swimming and water play activities. Having pool toys while your child is swimming around can make swimming more entertaining for them where all they will want to do during the summer is hang out by the pool. Each of these toys is beneficial to your child because they will promote your children to have an active lifestyle. Not only will they get your child moving but your child will enjoy those hot days of summer because they’ll be able to splash around and enjoy time in the pool. The larger floating toys such as the Shootball and volleyball game are all made with non-toxic materials that can be placed in the sun to dry out before storing. As with all toys and products, they will uphold quality best over time with proper care. This includes not leaving pool toys in the pool when they aren’t in use. These types of precautions ensure the longevity of your pool toys, and we made sure that the toys on this list aren’t high-maintenance in terms of promoting cleanliness. Swimming is absolutely a physical activity that involves movements of the entire body and changes in the heart rate. The level of intensity of physical activity depends on what a child is doing in the pool, but it is absolutely a great activity to promote exercise and a healthy lifestyle. All of the toys we included on the list are gender-neutral, which means that they are not decorated or designed to target boys or girls specifically. Gender-neutral toys are not marketed for specifically one gender or the other. Many toys are marketed for boys or for girls by including “feminine” or “masculine” colors and designs, and using only boys or only girls for advertising purposes. This sends the message to children that they are “supposed” to have certain interests based on gender-based stereotypes, and might even limit a child’s exploration of the world. Instead, gender-neutral toys send the message to children that they can play with whatever toys they want and they can be whoever they want to be. Every parent wants to make sure that they give their child educational toys so that they can help their child's developmental levels. 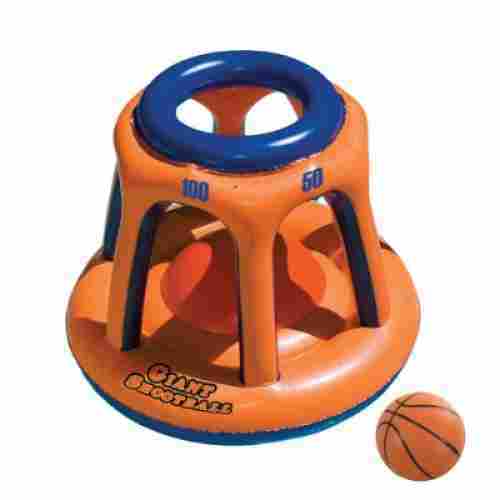 Each toy on our top ten list of best pool toys encourages physical activity for your children. Some of these even require your child to jump, catch, throw and of course swim. Physical activities and exercising in a pool will help your child going strong, healthy bodies and will even encourage your child towards an active lifestyle. Safety is important especially when it comes to swimming. When toys are involved with water play safety becomes a top main concern for parents. We wanted to make sure that we had a list of toys that all were 100% safe for your children to use. These toys were mostly made with plastic like materials or foam. 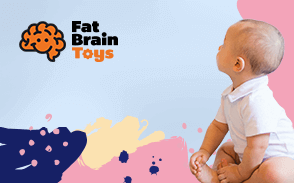 While it’s stated that some plastic and foam toys can contain harmful chemicals like BPA and other phthalates, we made sure that each toy on our list was made of nothing but safe materials. q: Do any of the plastic pool toys contain BPA? Absolutely not. None of the toys included on this list contain any BPA, a chemical which has been shown to be harmful when exposed to children. We always pick toys with safety and health in mind. q: Do these toys require parental supervision? Although the toys are considered safe for children, it is important that there is always a responsible adult, parent, or lifeguard supervising kids in the pool. q: Can I leave the toys in the pool when my kids aren’t using them? Leaving water toys in the pool, usually in chlorinated water and in the sun, can degrade the pool toys at a faster rate than storing them in a dry, shady place. q: Do the toys by Green Toys degrade over time since they are made of recycled milk jugs? Nope. The milk jugs are recycled and then processed into a durable material called high-density polyethylene that displays the same sturdiness as other similar hard plastic toys.